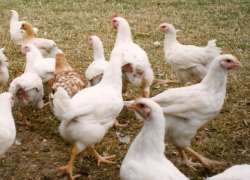 Our chickens and cockerels are reared to organic standards. They are brooded in small huts and once off heat, move from the brooding area, in their mobile huts to allow them access to our clover-rich organic pastures. The birds are reared slowly, allowing flavour to develop. They are fed a cereal-based, Soil Association approved ration and supplement this from the pasture around them. Our cockerels and chickens are all slaughtered individually on the farm, so reducing stress. We dry pluck the cockerels and finish plucking by hand. They are hung to improve in flavour and tenderness, before we dress them. Our organic chickens weigh from 4lbs to 6lbs. Oven-ready organic Christmas cockerels range from 6lbs to 12lbs in weight. For Christmas prices please see the Christmas page. We will have fresh chickens occasionally. We buy day old chicks from different breeds to ensure a range of weights. They are reared organically, slaughtered on-farm and hung prior to dressing. We may have laying hens for sale and layer hatching eggs. Contact us for details. Frozen portioned – the whole chicken will be weighed prior to cutting up, vacuum packing and labelling – 2 breasts, 2 thighs, 2 drumsticks, 2 wings, giblets & carcass. 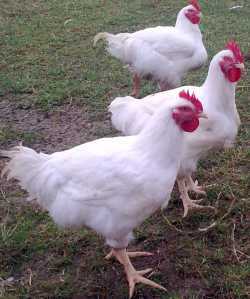 Chickens will be at the farm for collection by arrangement. We can send chickens by courier if you prefer. Please contact us for details and prices, courier charge based on up to 10kg. This year we have not reared any organic geese, but a local farmer has reared free range geese for us on his farm. 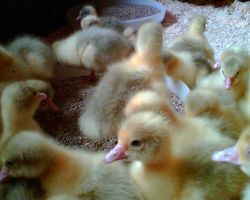 The goslings were fed on our organic starter crumbs and have then had free range access to forage. Our small flock of organic free range laying hens includes Columbian Blacktails, Bovan Nera, Leghorn, Araucana, Cream Legbar and Columbines. 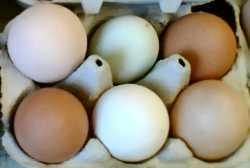 We get eggs ranging in colour from dark brown, through magnolia and white, to blue and green. Many of our customers remark on the bright yellow yolks of our eggs, especially the blue/green eggs. We occasionally have layers for sale. Call for details.